Post Expo 2016, held in Hong Kong on 24-26 May, has been hailed a huge success with numerous new product launches and more than 90 cutting-edge conference papers presented throughout the three-day show. The event, which celebrated its 20th anniversary this year, showcased everything from automated sorters, last mile delivery solutions and international logistics services to dynamic routing, addressing and optimization software. It attracted over 3,000 attendees! “These technologies are the drivers of the industry and Post-Expo, as the world's leading postal industry technology event, is the ideal platform to showcase the latest innovations,” said Tony Robinson, founder of Post-Expo and CEO of event organizer UKI Media and Events. Product launches included Datalogic’s new image-based barcode reader called Jade, which can help posts redefine smalls management and e-commerce order fulfillment with the ability to read any 1D code on any side of a small parcel or poly bag. K.Hartwell launched a new approach to handling mail using roll containers. The solution enables users to adapt existing roll containers to meet the needs of the e-commerce industry. 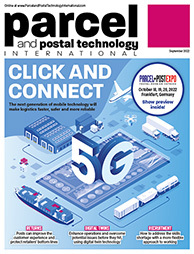 Other products unveiled included ParcelHome’s new personal home-delivery box; the IntelliSort sliding sortation system from automated material handling solutions provider Intelligrated; a new check-and-notify device for first- and last-mile physical boxes by Canada-based Snaile; and dynamic routing solutions from GeoRoute. Alongside the exhibition, Jessie Ting, postmaster general of Hongkong Post got the conference off to a flying start on day one with a presentation on how the post has turned its business around. Ting explained how Hongkong Post had gone through troubled times in the slow down around 2008 but has since moved into substantial profitability through good strategic development of new and existing market opportunities. Other topics covered in the conference included cross border e-commerce, first and last mile logistics, future leaders, growing and developing SME customers, trade and compliance, and the supply chain eco-system. Representatives from posts around the world joined in the discussion including from the USA, the UK, China, Israel, Korea, France, Australia, Switzerland, Sweden, Austria, Belgium, Canada and Germany. New for 2016 was the Live Innovation Showcase, which was held alongside the conference, and saw companies take to the stage to showcase new technologies such as agile optimization, the world’s first fully autonomous drone-based sorting center, addressing, big data and last-mile delivery robots. A popular presentation during the event was by KumardevChatterjee, the founder and CEO of Unmanned.Life and the developer of an end-to-end autonomous drone-based services (ADBS) platform. Chatterjee revealed details about the world’s first and only fully autonomous drone based sorting center, which is being built this year for one of the top ten global postal operators.